If an older dog stops using the pet door, the problem is usually related to aches and pains. 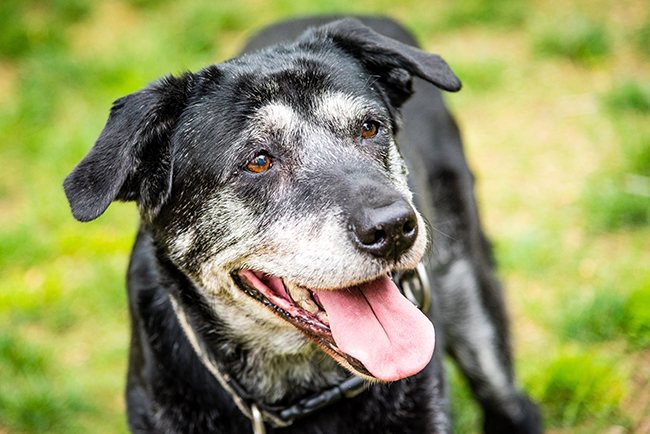 Arthritis is common among senior dogs and can make it difficult to get through. Start with visiting the vet. If the dog door poses a problem, other things probably do too, and no one wants their furry friend to be in pain. The vet will be able to help you pinpoint the problem. If your dog does suffer arthritis, there are great medications that will provide relief and improve quality of life. If getting through the door still poses a problem, lure your dog through and look at how they do it. Do they have to lift their legs a lot or duck their head? Is there a big drop on the outside of the door? The solution might installing a bigger door, or getting a ramp or steps to make it easier.